With our upcoming ESO Supernova — Planetarium and Visitor Centre here in Garching in mind, the ESO education and Public Outreach Department has started producing high-quality material for use in fulldome planetarium shows in the facility from 2017. As part of our mandate to communicate astronomy with our Member States and beyond, we are making this material available for free to other planetariums. This was announced today at the 2014 meeting of the International Planetarium Society in Beijing. 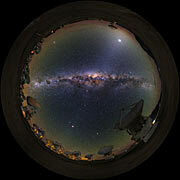 Planetarium producers can access the material in full resolution directly from our ESO website, and it is free to use, provided that the material is credited. All our materials are released under the Creative Commons Attribution 3.0 License, and are available in the highest resolution available online. We hope that these fulldome resources will help to create a lasting impression on planetarium visitors, transporting them to the fascinating sites of Chile, where our observatories are based, as we seek to bring the Universe closer than ever before.